Robin Rutherford, DDS has been listed as one of the 2014 Texas Super Dentists based on peer nomination and professional achievement. 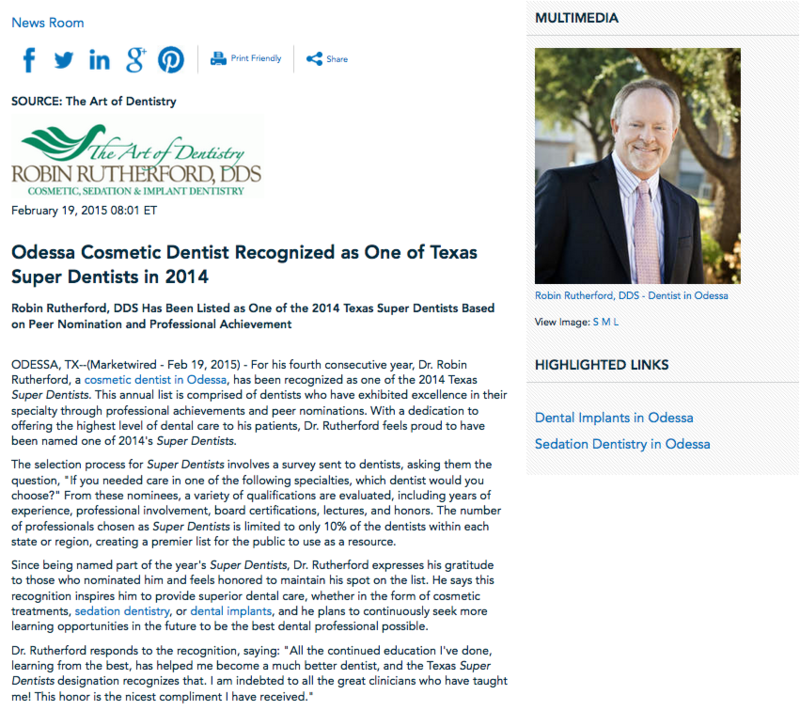 Odessa, TX – For his fourth consecutive year, Dr. Robin Rutherford, a cosmetic dentist in Odessa, has been recognized as one of the 2014 Texas Super Dentists. This annual list is comprised of dentists who have exhibited excellence in their specialty through professional achievements and peer nominations. With a dedication to offering the highest level of dental care to his patients, Dr. Rutherford feels proud to have been named one of 2014’s Super Dentists. The selection process for Super Dentists involves a survey sent to dentists, asking them the question, “If you needed care in one of the following specialties, which dentist would you choose?” From these nominees, a variety of qualifications are evaluated, including years of experience, professional involvement, board certifications, lectures, and honors. The number of professionals chosen as Super Dentists is limited to only 10% of the dentists within each state or region, creating a premier list for the public to use as a resource. Since being named part of the year’s Super Dentists, Dr. Rutherford expresses his gratitude to those who nominated him and feels honored to maintain his spot on the list. He says this recognition inspires him to provide superior dental care, whether in the form of cosmetic treatments, sedation dentistry, or dental implants, and he plans to continuously seek more learning opportunities in the future to be the best dental professional possible. Dr. Rutherford attended dental school at the University of Texas Dental School at San Antonio and finished within the top quarter of his class. He has been featured in various media sources on numerous occasions for his extensive knowledge and reputation in the dental field. Dr. Rutherford recently earned the title of “Best Selling Author” for the book “A Cup of Coffee with 10 of the Top Cosmetic Dentists in the United States”. He is a member of the American Academy of Cosmetic Dentistry and the American Orthodontic Society, as well as a Fellow of the Dental Organization for Conscious Sedation and a Diplomate of the American Dental Implant Association. Dr. Rutherford is available for interview upon request.